Serena Bellingham is faced with an impossible choice. Either leave her struggling family to serve the eccentric genius, Edward King, or stay, only to see the same man imprison her father. Her decision leads her to Aleron House, a home shrouded in secrecy, strange attitudes and even stranger happenings. Is Edward King all that she has heard, or is the truth something entirely different? Is it possible that the handsome architect might need her even more than her beloved family does? 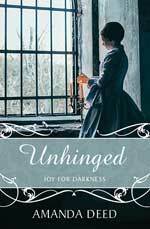 Unhinged is an Australian retelling of Beauty and the Beast, complete with a mysterious curse and a precious rose.